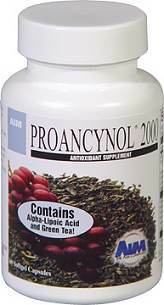 Proancynol 2000  contains some of the most powerful, natural antioxidants ever discovered. A unique blend of green tea, grape seed extract, alpha-lipoic acid, and other powerful antioxidants, helps fight free radicals and maintain a healthy immune system. The immune system is the army that protects us from invaders. It extends throughout all body systems and is linked to our brain and affected by our state of mind. It protects us from bacteria, viruses, and cancer cells. Its basic strategy is simple: recognize the enemy and attack. The immune system is perhaps the "most important" body system when considering living well and maintaining good health. A healthy immune system can meet all challenges. Free radicals are highly reactive forms of oxygen that damage cells throughout the body. As your body creates energy at the cellular level, oxygen is metabolized, changing its structure. In this process, the oxygen molecule loses one electron, turning it into a free radical. Free radicals also are created through detoxifying rancid fats and chemicals, such as drugs, food additives, and preservatives; and by cigarette smoke, pollutants, sunlight, radiation, and emotional stress. According to Richard Passwater, Ph.D., in his book Lipoic Acid, The Metabolic Antioxidant, free radicals can result in approximately 80 different age-related diseases. These include cancer, heart attack, stroke, rheumatoid arthritis, cataracts, and Alzheimer’s disease. Antioxidants fight free radicals and thus protect us from age-related diseases. The antioxidants found in green tea are polyphenolic catechins. The best known of these are epicatechin (EC), epigallocatechin (EGC), epicatechin gallate (ECG), and epigallocatechin gallate (EGCG). Each of these molecules is an increasingly potent antioxidant. EC cannot neutralize as many free radicals as EGC, which cannot neutralize as many free radicals as ECG, which cannot neutralize as many free radicals as EGCG. In laboratory studies presented at a September 1997 meeting of the American Chemical Society, EGCG proved to be 100 times more effective at neutralizing free radicals than vitamin C and 25 times more effective than vitamin E.
Research does suggest that this antioxidant power may translate into helping to maintain immunity. In animal studies conducted in Japan in the early 1990s, green tea polyphenols increased activation of macrophages, B lymphocytes, T lymphocytes, and natural killer cells. All of these are white blood cells, which are the "foot soldiers" of the immune system. Grape seed extract contains powerful antioxidants known as oligomers of proanthocyanidins (OPCs). Some studies say that OPCs are 20 times more powerful than vitamin C and 50 times more powerful than vitamin E. Grape seed is one traditional source of OPCs, although they are present throughout the plant world. In a review of the benefits of the OPCs found in grape seed extract, Bombardelli and Morazzoni (Fitoterapia 66, no. 4 ) note that OPCs’ antioxidant effects are generally credited for their other benefits. The authors note that these include an antimutagenic effect; that is, they inhibit the mutation of DNA. The authors point out that chronic degenerative diseases are believed to be a result of environmental mutagens (substances that cause mutation). OPCs may be able to counter these mutagens. OPCs also have "cosmetic" value. They protect collagen and elastin, which are an important part of the makeup of skin. It is the interlacing of collagen and elastin which gives skin its strength, elasticity, and smoothness. When these two substances are damaged, the skin loses elasticity—the result can be wrinkles. OPCs help restore damaged collagen and elastin and protect them against further damage. You could say that OPCs are an oral cosmetic to keep skin healthy. Although little known, N-acetylcysteine (NAC) is a powerful antioxidant and a powerful tool in maintaining immunity. It has been used since the 1960s as a mucolytic—that is, a substance that breaks up mucus, especially in lung tissue—and has also been used for years in hospital emergency rooms to counteract acetaminophen poisoning. Clinical trials in Europe have indicated that NAC may also offer protection against the flu and flulike symptoms. NAC provides benefits because it helps increase the levels of one of the body’s most important and most powerful antioxidants: glutathione. The body itself produces glutathione to help it deal with the free radicals generated as part of our own metabolism. N-acetylcysteine is used by the body to create more of this powerful and indispensable antioxidant. Research into NAC also indicates that it may enhance the production of human T-cells, an important part of the immune system. Alpha-lipoic acid is a "new" antioxidant that may turn out to be the most important of all antioxidants. First of all, it is the only antioxidant that is both water-soluble and fat-soluble. This means that it can access all parts of our cells, which have both water-soluble and fat-soluble components. This enhances its ability to destroy free radicals throughout the entire cell. Alpha-lipoic acid also works with other antioxidants to boost their levels. When you take alpha-lipoic acid, you are also increasing your levels of vitamins C and E, glutathione, and coenzyme Q10. Alpha-lipoic acid is especially powerful as an anti-aging substance. Aging can be described as a process that reduces the number of healthy cells in the body. The major factors in reducing healthy cells are free radical damage and glycation. Glycation is the process in which protein in the body reacts with excess blood sugar (glucose). This damage is as detrimental to our health as that caused by free radicals. Alpha-lipoic acid may keep blood sugar under control, which reduces glycation, and thus slows the aging process. Both free radicals and glycation affect the appearance of proteins found in the skin. Thus, a secondary benefit of alpha-lipoic acid (and all antioxidants) is that we look "young for our age." Selenium is an antioxidant mineral. It works together with other antioxidant enzymes to fight free radicals. Selenium is very important because it forms part of the structure of the important antioxidant enzyme glutathione peroxidase, which in turn recycles glutathione. Selenium may also protect against cancers and cardiovascular disease. Rosemary extract is increasingly under scrutiny for its antioxidant properties. Like other antioxidants, it inhibits and fights free radicals. Recent studies show that rosemary extract, and its constituents carnosol and ursolic acid, enhances the activity of enzymes that can detoxify carcinogens: animal studies show that the extract results in an increase in glutathione-S-transferase, one of these enzymes. Other animal studies have indicated a beneficial effect on the promotion of skin and mammary tumors. Lycopene, an antioxidant carotenoid found in abundance in tomatoes, has been found to be twice as effective as beta carotene and 100 times more effective than vitamin E in counteracting the free radical singlet oxygen. Singlet oxygen is a dangerous free radical. Lycopene first received attention when it was discovered that it significantly reduces the risk of developing prostate cancer. AIM Proancynol 2000™ combines the proven antioxidants found in green tea and grape seed extracts with powerful antioxidant "newcomers" N-acetylcystiene and alpha-lipoic acid, as well as rosemary extract, selenium, and lycopene. What makes AIMProancynol 2000™ powerful is the synergy between its various components. They are not only powerful individually, but also work together in what is known as antioxidant cycling. Antioxidant cycling is the term that describes how antioxidants work together to extend each others’ lives and make each other more powerful. When the antioxidant vitamin E disables free radicals, it becomes a minor free radical. Both vitamin C and alpha-lipoic acid convert the radical form of vitamin E back to its antioxidant-self. However, when vitamin C recycles vitamin E, it changes to a free radical. Alpha-lipoic acid and glutathione can both "recycle" vitamin C back into a potent antioxidant. Glutathione not only recycles vitamin C, but is the cells’ primary antioxidant. According to Lester Packer, Ph.D., maintaining high levels of glutathione is critical for life—low glutathione levels are a marker for death at an early age. Glutathione diminishes as we age and cannot be boosted significantly through supplements. N-acetylcysteine is used by the body to manufacture glutathione, and alpha-lipoic acid regenerates glutathione, ensuring that the body has an adequate supply. Selenium is part of the enzyme glutathione peroxidase, which recycles glutathione. OPCs also play a role in cycling as they sacrifice themselves in order to neutralize harmful free radicals within the body. In doing so, they make it possible for vitamins C and E and selenium to do less "antioxidant" work, allowing these nutrients to perform their other functions in the body. You can see how the ingredients found in AIM Proancynol 2000™ work together to provide optimum free radical protection. • Take 2 capsules per day. Best taken with meals. • Shelf life is 2 years, sealed. Close tightly after opening and store in a cool, dry, dark place (70-75 °F; 20.1-23.8 °C). Do not refrigerate. Who should use AIM Proancynol 2000™? Anyone who is concerned with overall health and a healthy immune system. AIM Proancynol 2000™ is especially suited to those who have a lifestyle that may generate more free radicals than normal. This would include living in polluted environments, smoking, or participating in extensive exercise (exercise creates free radicals). Is there anyone who should not take AIM Proancynol 2000™? There are no known safety considerations concerning the ingredients in AIM Proancynol 2000™. However, due to the alpha-lipoic acid present, diabetics should monitor their blood sugar levels. Pregnant women and people who are using other medications or who have serious health problems should always consult their health practitioners when adding new substances to their diet. Does the green tea extract contain caffeine? The green tea used in AIM Proancynol 2000™ is decaffeinated using a water filtration-decaffeination process. Like all decaffeinated products, some amounts of caffeine remain. What can you tell me about the ingredients found in AIM Proancynol 2000™? The extracts (green tea, grape seed, and rosemary) are obtained by using an alcohol and water extraction process. Although the original plants are not organically grown, any impurities that were present in the raw materials are not present in the finished product. The grape seeds are derived from both red and white grapes. The rosemary is standardized to 6 percent carnosic acid. The alpha-lipoic acid is derived from potatoes. Think of a fire. It is continuously burning, creating energy. In this process, sparks are thrown off. If the sparks are minimal, or land in a safe place, there is no damage. However, if the sparks multiply, or land on something flammable, a greater fire and destruction may result. However, if we put a grill around the fireplace, the sparks hit this and fall to the ground extinguished. They can do no harm, no matter how many are produced. This is what happens to us. Our bodies continuously produce free radicals, which are our sparks. These sparks are multiplied because of the foods we eat and the environment in which we live. When too many free radicals are created, they can result in damage—many of today’s most frequent diseases, such as heart disease, stroke, cancer, cataracts, and immune disorders are due to free radicals. Antioxidants serve as our grill, extinguishing free radicals before they can damage us. Mitscher, Lester A., Ph.D., and Victoria Dolby. The Green Tea Book. Garden City Park, NY: Avery Publishing Group, 1998. Packer, Lester, Ph.D., and Carol Colman. The Antioxidant Miracle. New York: John Wiley & Sons, 1999. Passwater, Richard, Ph.D. Lipoic Acid: The Metabolic Antioxidant. New Canaan, CT: Keats Publishing, Inc., 1995. Schwitters, Bert (with Jack Masquelier). OPCs in Practice. Rome: Alpha Omega, 1993.